The objective of the current study was to determine the prevalence and the degree of lowered self-esteem across the spectrum of psychiatric disorders. The present study was carried out on a consecutive sample of 1,190 individuals attending an open-access psychiatric outpatient clinic. 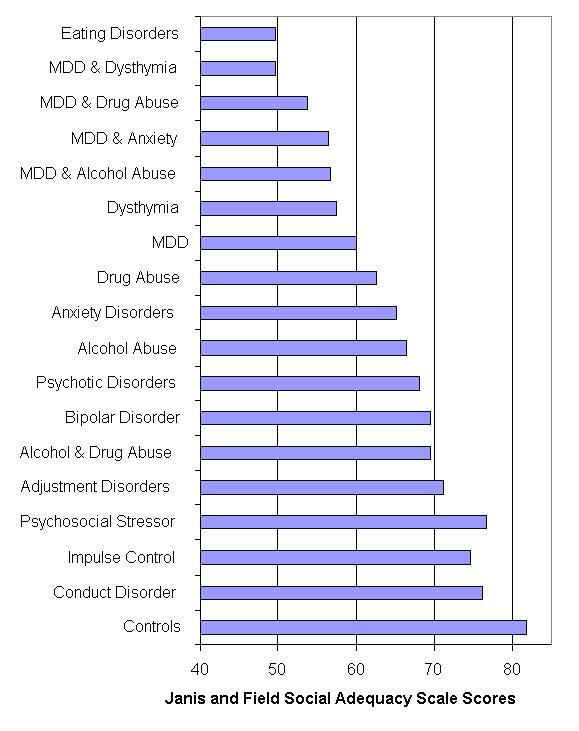 There were 957 psychiatric patients, 182 cases with conditions not attributable to a mental disorder, and 51 control subjects. Patients were diagnosed according to DSM III-R diagnostic criteria following detailed assessments. At screening, individuals completed two questionnaires to measure self-esteem, the Rosenberg self-esteem scale and the Janis and Field Social Adequacy scale. Statistical analyses were performed on the scores of the two self-esteem scales. The results of the present study demonstrate that all psychiatric patients suffer some degree of lowered self-esteem. Furthermore, the degree to which self-esteem was lowered differed among various diagnostic groups. Self-esteem was lowest in patients with major depressive disorder, eating disorders, and substance abuse. Also, there is evidence of cumulative effects of psychiatric disorders on self-esteem. Patients who had comorbid diagnoses, particularly when one of the diagnoses was depressive disorders, tended to show lower self-esteem. Based on both the previous literature, and the results from the current study, we propose that there is a vicious cycle between low self-esteem and onset of psychiatric disorders. Thus, low self-esteem increases the susceptibility for development of psychiatric disorders, and the presence of a psychiatric disorder, in turn, lowers self-esteem. Our findings suggest that this effect is more pronounced with certain psychiatric disorders, such as major depression and eating disorders. Self-esteem is an important component of psychological health. Much previous research indicates that lowered self-esteem frequently accompanies psychiatric disorders [1–5]. It has been suggested that low self-esteem is an etiological factor in many psychiatric conditions as well as in suicidal individuals . Self-esteem also plays some role in quality of life for psychiatric patients . However, the nature of the relationship between lowered self-esteem and psychiatric disorders remain uncertain. It is not yet clear if lowered self-esteem occurs in a few psychiatric conditions, being relatively specific to them, or if it is simply representative of poor psychological health regardless of the diagnosis. One of the major problems in the area of self-esteem research is the lack of a clear consensus definition. Self-esteem has been given a number of different definitions, each emphasising different aspects . Hence, measurement instruments based on different definitions sometimes have poor correlation. An appropriate approach to better evaluate self-esteem may therefore be to use more than one measure of self-esteem. Lowered self-esteem has been consistently found to occur in several psychiatric disorders. These include major depressive disorder, eating disorders, anxiety disorders, and alcohol and drug abuse. For example, there are multiple studies demonstrating that patients with major depressive disorder have lowered self-esteem [2, 8, 9]. Lowered self-esteem has also been considered a psychological hallmark of most patients with eating disorders [10–12]. Indeed, lowered self-esteem has been suggested to be the final common pathway leading to eating disorders [13, 14]. Studies have shown that with increasing anxiety self-esteem decreases [15, 16, 5]. However, in a study comparing the self-esteem of patients with different psychiatric diagnoses, patients with anxiety disorders had the highest self-esteem . The relationship between alcohol dependence and lowered self-esteem has also long been recognised [1, 18, 19]. A relationship between the use of drugs and low self-esteem has been demonstrated in a number of studies [20–23]. Despite these studies, it remains unclear whether lowered self-esteem occurs in a few discrete psychiatric conditions, or in all psychiatric conditions, and also whether self-esteem is equally lowered in different psychiatric conditions. The aim of the present study is to address these issues. The current study was carried out on data collected on a consecutive sample of 1,190 cases attending the Walk-In clinic at the University of Alberta Hospital, Edmonton, Canada. The sample consisted of 957 psychiatric patients, 182 cases with conditions not attributable to a mental disorder but due to psychosocial stressors ("V-codes" in DSM-III R), and 51 controls who accompanied patients and were themselves assessed but did not receive a psychiatric diagnosis (controls). The Walk-In clinic refers to a psychiatric open access clinic where patients can refer themselves or be referred through a family doctor. A therapist, who is a psychologist, a social worker or a psychiatric nurse, sees each patient. Any diagnoses made are then confirmed during a subsequent interview with a psychiatrist, with a final consensus diagnosis being made according to DSM III-R criteria. It is common practice in the Walk-In clinic that frequently the individuals who accompany the patient, particularly the family members, will also be assessed. As part of the assessment, all subjects complete a questionnaire containing two self-esteem scales. Two well-recognized patient-completed questionnaires were used to measure self-esteem. These were the Janis and Field Social Adequacy Scale (JF Scale)  and the Rosenberg Self-Esteem Scale (Rosenberg Scale) . The JF Scale is available in Appendix 1 (see additional file 1) and the Rosenberg Self-Esteem Scale is available in Appendix 2 (see additional file 2). The JF Scale consists of 23 self-rating items, which measure anxiety in social situations, self-consciousness, and feelings of personal worthlessness. The maximum score is 115, and a higher score reflects increased self-esteem. Reliability estimates based on the Spearman-Brown formula and split-half reliability estimates for this scale are 0.91 and 0.83, respectively. The Rosenberg Scale measures global self-esteem and personal worthlessness. It includes 10 general statements assessing the degree to which respondents are satisfied with their lives and feel good about themselves. In contrast to the JF Scale, a lower score reflects higher self-esteem. In the original report, Rosenberg quoted a reproducibility of 0.9 and a scalability of 0.7. The Rosenberg Scale has previously been validated in other studies [25–27]. It is the most widely used scale to measure global self-esteem in research studies. Individuals were categorized as being in one of the 19 groups, including two groups of controls (the "psychosocial stressor" group and the healthy "control" group). 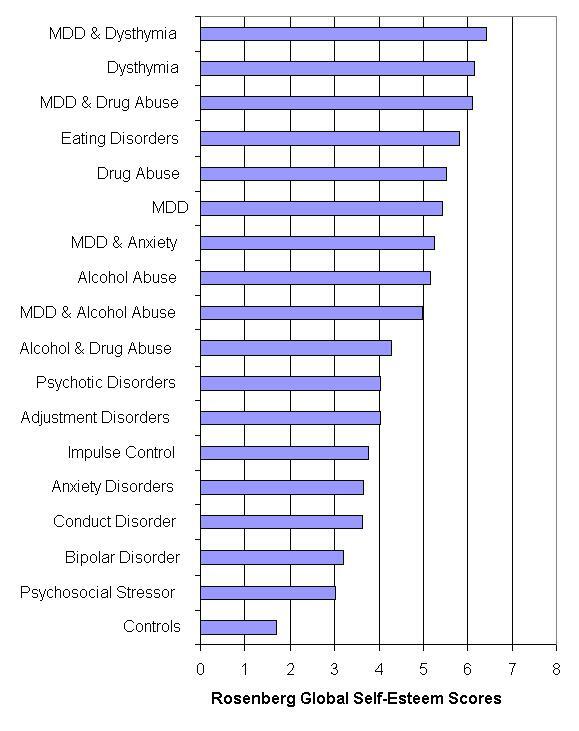 Eleven of these groups, namely psychotic disorders; major depression; dysthymia; bipolar disorder; anxiety disorders; alcohol use disorders; drug use disorders; eating disorders; adjustment disorder; conduct disorder; and impulse control disorder were according to the DSM-III-R classification with two modifications: the group named "psychotic disorders" consisted of schizophrenia, and psychotic disorders not elsewhere classified; the psychoactive substance use disorders was divided into two groups, namely "alcohol use disorders" (consisting of alcohol abuse and alcohol dependence) and "drug use disorders" (consisting of drug abuse and drug dependence). Five groups consisted of patients who had comorbid diagnoses. These groups were major depression and anxiety disorders; major depression and dysthymia; major depression and alcohol use disorders; major depression and drug use disorders; and alcohol and drug use disorders. The final group consisted of patients with any other psychiatric diagnoses. Analysis of variance (ANOVA) was used to examine the data. The two measures of self-esteem were considered as dependent variables, and all psychiatric diagnoses were considered as independent variables or factors. In cases where the result of ANOVA showed statistically significant differences between the means, post-hoc Student-Newman-Keuls test for multiple comparisons was applied. The Levene test was used to examine the homogeneity of variances, a main assumption in ANOVA. In the current study the correlation coefficient between the two scales of self-esteem was -0.72, showing a high correlation. Comparing the self-esteem of the 19 independent groups by ANOVA indicated that they were significantly different (F18,1064 = 10.63, P < 0.0001). Further probing with the use of the Newman-Keuls test for multiple comparisons demonstrated the following findings (Table 1 and Figure 1). Effect of diagnosis on the mean score on the Janis and Field Social Adequacy scale. This figure shows that feelings of social adequacy vary widely between different diagnostic groups. Control patients had the highest scores, and the highest self-esteem, with this measure. Dual diagnoses patients with Major Depressive Disorder ("MDD") had significantly lower scores, as did patients with a single diagnosis of Eating Disorders, Dysthymia, and MDD. The differences between groups that reached statistical significance are given in the text. 1) The range of self-esteem scores differed widely between different patient groups, and the control group had the highest score. The self-esteem of the control group was significantly greater than those of 11 groups of psychiatric patients, namely: "eating disorders (P < 0.001)", "major depression and dysthymia (P < 0.001)", "major depression and drug use disorders (P < 0.001)", "major depression and anxiety disorders (P < 0.001)", "major depression and alcohol use disorders (P < 0.001)", "dysthymia (P < 0.001)", "major depression (P < 0.001)", "drug use disorders (P < 0.001)", "anxiety disorders (P < 0.001)", "alcohol use disorders (P < 0.01)", and "others (P < 0.01)". 2) The Psychosocial stressor group had statistically significantly higher self-esteem compared to patients with eating disorders (P < 0.001), dysthymia (P < 0.001), major depression (P < 0.001), and comorbidity of major depression and dysthymia (P < 0.001), major depression and drug abuse (P < 0.05), major depression and anxiety disorders (P < 0.01), and major depression and alcohol use disorders (P < 0.001). 3) Patients with a diagnosis of adjustment disorders had statistically significantly higher self-esteem compared to patients with eating disorders (P < 0.001), major depression (P < 0.001), dysthymia (P < 0.001), and comorbidity of major depression and dysthymia (P < 0.001), major depression and alcohol abuse disorders (P < 0.01), and major depression and anxiety disorders (P < 0.05). 4) Patients with comorbidity of major depression and dysthymia had significantly lower self-esteem compared to patients with diagnosis of conduct disorder (P < 0.001), adjustment disorder (P < 0.001), impulse control disorders (P < 0.01), psychotic disorders (P < 0.05), alcohol use disorders (P < 0.05), and anxiety disorders (P < 0.05). 5) Patients with eating disorders had the lowest scores on the JF scale and thus the lowest level of self-esteem. They had statistically significantly lower self-esteem compared to patients with diagnosis of adjustment disorder (P < 0.001), conduct disorder (P < 0.01), and impulse control disorders (P < 0.05). 6) In addition to the groups of eating disorders and comorbidity of major depression and dysthymia, patients with the diagnosis of dysthymia (P < 0.05), and patients with the comorbidity of major depression and alcohol abuse (P < 0.05) had statistically significantly lower self-esteem compared to patients with conduct disorders. 7) There was a trend that patients with comorbid diagnoses had a lower self-esteem compared to the patients with sole diagnosis. For example, the self-esteem of patients with comorbid major depression and dysthymia were lower compared to patients with either major depression or dysthymia alone. However, none of the differences reached statistical significance. Effect of diagnosis on the mean score on the Rosenberg global self-esteem scale. This figure shows that feelings of low self-esteem vary widely between different diagnostic groups. Control patients had the lowest scores (and the highest self-esteem) using this scale. Dual diagnoses patients with Major Depressive Disorder ("MDD") had significantly lower scores, as did patients with a single diagnosis of Eating Disorders, Dysthymia, Drug abuse, and MDD. The differences between groups that reached statistical significance are given in the text. 1) The normal group had the highest level of self-esteem and patients with comorbidity of depression and dysthymia had the lowest level of self-esteem. As with the JF scale, the range of scores differed widely between different patient groups. The control group had significantly higher self-esteem compared to 11 of the psychiatric patient groups, namely: "eating disorders (P < 0.001)", "dysthymia (P < 0.001)", "major depression (P < 0.001)", "drug use disorders (P < 0.001)", "alcohol use disorders (P < 0.001)", adjustment disorders (P < 0.001), "major depression and dysthymia (P < 0.001)", "major depression and drug use disorders (P < 0.01)", "major depression and anxiety disorders (P < 0.001)", "major depression and alcohol use disorders (P < 0.001)", and "others (P < 0.01)". 2) The Psychosocial stressor group had significantly higher self-esteem compared to patients with the following diagnoses; "eating disorders (P < 0.05)", "dysthymia (P < 0.001)", "major depression (P < 0.001)", "drug use disorders (P < 0.01)", "alcohol use disorders (P < 0.01)", "major depression and dysthymia (P < 0.001)", " "major depression and anxiety disorders (P < 0.05)". This finding suggests that the presence of a psychiatric disorder has a more important role in the decrease of self-esteem levels compared to the presence of stressful life circumstances. 3) Patients with either major depression or dysthymia, had significantly lower self-esteem compared to patients with anxiety disorders (P < 0.01) or adjustment disorder (P < 0.01). Dysthymic patients also had significantly lower self-esteem than that of bipolar disorder patients (P < 0.05). Self-esteem is an abstract concept, which has a composite nature. Available measurements of self-esteem usually measure different components of this global entity. For example, the Janis and Field Self-Esteem Inventory primarily measures anxiety in social situations, self-consciousness and feelings of personal worthlessness; three components of what its inventors called feelings of social adequacy. Some investigators like Rosenberg tried to devise a scale that can capture primarily the global entity of self-esteem. In the present study both scales of self-esteem have been used to better capture different aspects of self-esteem. Nonetheless, the high correlation between the two scales in the present study suggests that they measure overlapping aspects of self-esteem. Before examining the results of the present study two potential concerns need to be addressed. Firstly, the control group was not randomly selected, and its size was small in comparison to the patient population. Furthermore, they were not the primary focus of the psychiatric assessment, and hence, the presence of a psychiatric condition may have been overlooked. Nonetheless, the mean score on the Rosenberg scale for the normal control group in the present study was 1.71, which is very similar to the findings in larger studies using the Rosenberg scale in normal controls [25–28]. Thus, the control group in the present study appears to be similar to results reported from previous normal control groups. Secondly, a semi-standardised interview, such as the SCID (Structured Clinical Interview for DSM-III-R) , was not used in the diagnostic process. However in our study, a patient first completed a detailed questionnaire, and then had an extensive interview with an experienced non-physician therapist, followed by an interview with one of a small group of experienced psychiatrists in the presence of the therapist. A consensus diagnosis was then reached. Such a diagnostic method leads to a high level of diagnostic consistency. Therefore, we do not believe that the absence of a standardised interview process adversely affected the results. A number of previous studies have reported lower self-esteem in psychiatric patients compared to normal controls. Our findings confirm these previous studies and extend them based on the following key findings. The present study shows that all psychiatric patients had lower self-esteem compared to the control group. However, the degree of lowering of self-esteem in psychiatric patients varied with their diagnostic groups. Also, most psychiatric patients had a lower level of self-esteem compared to the Psychosocial stressor group. Furthermore, patients with comorbidity of psychiatric disorders, particularly when one of the diagnoses was major depressive disorder, tended to have lower self-esteem compared to patients who suffered from only one of those disorders. The lower level of self-esteem in psychiatric patients compared to normal and Psychosocial stressor groups, and the tendency towards lower self-esteem in patients with comorbidity, suggest that the presence of any psychiatric disorder lowers self-esteem. In other words, when patients develop a psychiatric disorder, self-esteem is affected. The presence of more than one disorder can lower self-esteem further. The considerable difference between the self-esteem of patients with different psychiatric diagnoses suggests that the type of psychiatric disorder is linked to the degree by which self-esteem is lowered. Since the present study is not a longitudinal study, we were not able to determine if the self-esteem of these patients was lowered before they became ill or if it was improved as their illness improved. This requires further longitudinal research. The link between low self-esteem and depressive disorders is well known and documented [8, 9, 6], and is further demonstrated in the current study. There is convincing evidence of a reciprocal link between depressive mood states and self-esteem, but the causal direction of this association is not obvious. It is certainly true that low self-esteem arises during major depression [30–35] and depressive subtypes such as seasonal affective disorder . It has also been proposed that low self-esteem also acts as a vulnerability factor for the development of major depression [37–39]. Low self-esteem also adversely affects prognosis, at least in women, and may be a very useful factor for prognosis . There is certainly evidence that changes in either depressive state or self-esteem can affect the other. It has been shown that, as the mood of depressed patients improves, their level of self-esteem also increases . Also, following the onset of a depressive illness, self-esteem levels decrease . Furthermore, with enhancement of self-esteem, the condition of depressed patients improved , whilst a lowering of self-esteem has been shown to produce depression . There is also some uncertainty about the trait vs. state nature of this interaction. The previously quoted studies show evidence of a state-dependent effect. Nonetheless, there is also some evidence for a trait effect. It has been reported that self-esteem lability is a better index of depression proneness than low self-esteem as a trait . It has also been suggested that low self-esteem may be a final common pathway to the development of depression [37, 42]. The present study further confirms the close relationship between lowered self-esteem and the presence of depression but is not able to further clarify if it is a trait or state relationship. Interestingly, lowered self-esteem has also been shown to occur in other depressive disorders such as dysthymia . In fact, lowered self-esteem is one of the diagnostic criteria for dysthymic disorder. In view of the findings from the present study that lowered self-esteem occurs across the psychiatric spectrum, it may not be appropriate to use lowered self-esteem in the diagnostic criteria for any individual psychiatric condition. The present study confirms that patients with dysthymia have lowered self-esteem. Interestingly, this is the first study to report that patients with comorbidity of major depression and dysthymia had lower self-esteem compared to patients with either major depression or dysthymia alone. This suggests that the lowering of self-esteem can be cumulative with different depressive disorders. The presence of lowered self-esteem among patients with eating disorders has been widely shown in previous studies [13, 10, 11]. It has been suggested that low self-esteem may be an epidemiological risk factor for eating disorders [46, 47, 14], and we have previously suggested that low self-esteem is the final common pathway in the etiology of eating disorders . The present study further confirms the finding that eating disordered patients have lowered self-esteem, and extends these findings by showing that these changes in self-esteem are among the most severe for any patient group. Indeed, in one measure of self-esteem, the eating disordered patients had lower self-esteem than any other group, including those with comorbid diagnoses. Significant comorbidity has been found between eating disorders and major depression, anxiety disorders, and alcoholism [10, 11]. Because of high comorbidity between eating disorders and major depression, it might be suggested that the association between low self-esteem and eating disorders is secondary to the association of eating disorders and major depression. However, we and others have shown that low self-esteem occurs in patients with eating disorders in the absence of depression [10, 13]. The overall findings from the studies to date, including the present study, is that patients with eating disorders have very significant lowering of self-esteem that may predate the onset of the disorder and contribute to its development. Further research in this area is required to clarify this relationship further. Previous studies have shown those patients with alcohol use disorders [1, 18, 49, 19] or drug use disorders [20, 22, 23] have lowered self-esteem compared to controls. The results from the present study confirmed this finding, with both these patient groups having significantly lower self-esteem than the controls. The results also showed that these patients had a moderate level of self-esteem compared with other psychiatric patient groups. Interestingly, in those patients where there was a comorbid major depressive disorder, the self-esteem was lower than that for either condition alone, although this did not reach statistical significance. The relevance of this can is emphasized by the finding that low self-esteem in alcohol-use disorders can increase suicidal risk . As well as the findings with the depressed, eating disordered, and alcohol abuse and drug abuse patients, the present study examined self-esteem in a number of patient groups that have not been much studied previously. We observed that patients with bipolar disorder in the manic phase had high self-esteem levels compared to other patients, but still a lowered self-esteem compared to controls. One other study also suggested that bipolar patients may have altered self-esteem . In the present study patients with anxiety disorders had significantly lower self-esteem than the control group but a significantly higher self-esteem compared to some of the patient groups. This finding is in keeping with a previous study in which global self-esteem (measured with the Rosenberg self-esteem scale) was higher in patients with anxiety disorders compared to five different psychiatric conditions including depression, psychosis, personality disorder, and alcohol dependence . Also, previous studies have found lower levels of self-esteem in anxiety disordered patients compared to controls [52, 53, 17]. There are a limited number of previous studies regarding self-esteem of psychotic patients, although one recent large study has suggested low self-esteem may be a risk factor for development of psychosis . In our study, patients with psychotic disorders had intermediate levels of self-esteem compared to other psychiatric conditions. However, psychotic patients had significantly lower self-esteem levels than controls, which is consistent with the findings of a previous study . In our study, patients with impulse control disorders were not significantly different from controls. One group  has found similar results, although in patients with both attention-deficit and hyperactivity disorder (ADHD) and comorbidity, self-esteem was significantly lowered. Based on both the previous literature, and the results from the current study, we propose that there is a vicious cycle between low self-esteem and psychiatric disorders. Low self-esteem makes individuals susceptible to develop psychiatric conditions, particularly depressive disorders, eating disorders, and substance use disorders. The occurrence of these disorders subsequently lowers self-esteem even further. When more than one psychiatric disorder is present then the effects on self-esteem are additive.